The XTENDEX® HDMI Extender transmits digital video and audio signals up to 200 feet from an HDMI source. Each video extender consists of a local unit that connects to an HDMI source (Blu-Ray player, satellite receiver, etc. ), and a remote unit that connects to an HDMI display. The local and remote units are interconnected via one CAT6/7 solid cable. Optional daisy-chain receivers allow you to extend one video source to multiple displays and to reach longer distances. The daisy-chain receivers are available in one-output and three-output options. One female RJ45 port for sending high definition video/audio signals and DDC signal. 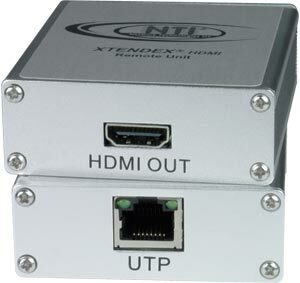 Signal type: HDMI 1.2, HDCP 1.1 compliant. Maximum extension is 200 feet using CAT7 solid 600 MHz STP cable, and 150 feet using CAT6 solid 550 MHz cable. One-output and three-output models available. Enables a daisy chain of five receivers at 1080p / eight receivers at 1080i/720p. The three-output receiver supports three displays for a total of 15 displays at 1080p and 24 displays at 1080i. ST-C5HDMI-RD-150: one female HDMI-A port for HDTV or computer display. ST-C5HDMI-RD3-150: three female HDMI-A ports for HDTVs or computer displays. Only every third receiver in daisy-chain needs power supply. Maximum extension is 150 feet using CAT7 solid 600 MHz STP cable or CAT6 solid 550 MHz cable. Local unit: 100 or 240 VAC at 50 or 60 Hz via AC adapter (included). Remote unit: powered from local unit via CAT6/7 solid cable. Power Consumption: Local unit: 6W; Remote unit: powered from local unit. CAT6 UTP solid 550 MHz or better cable with TIA/EIA-568B wiring terminated with standard RJ45 connectors is recommended for 1080p applications (not included). Operating temperature: 5°F to 122°F (-15°C to 50°C). Storage temperature: -40°F to 185°F (-40°C to 85°C). Operating Relative Humidity: 0% to 90% non-condensing RH. Storage Relative Humidity: 0% to 80% non-condensing RH.